You may have heard that Growth-Driven Design is a new and better build and grow your website, turning the web into a greater source of new patients. The concept makes a lot of sense when you're trying to use your website as more than just a brochure. The Growth-Driven Design process will actually help you bring in more visitors, engage them and ultimately help the practice meet its goals for patient growth. Finalize your marketing strategy and goals and understand what you want the website to do for you, ie: bring in a higher percentage of the patients in your area of specialty. Create a list of everything you'd like your website to have and do. Prioritize the list to get you down to what you really need to get visitors to take a specific action. Build the website in just a few weeks time (2-4 weeks) with the top 20% of your priority list. As an ongoing process, choose items on the priority list to start adding, testing and tweaking each month using a process for strategy, design, implementation, testing and reporting on the results. The orange timeline in the diagram below when you use Growth-Driven Design. Compare how much impact you can have ove the course of the next few years compared to the traditional web design process. When you get behind the steering wheel in your car you have a destination in mind and a plan for how you're going to get there. Your marketing should be the same thing. 1) Set a goal for what you want to do. 2) Brainstorm ways to get there. 3) Choose the things that will get you there the fastest. 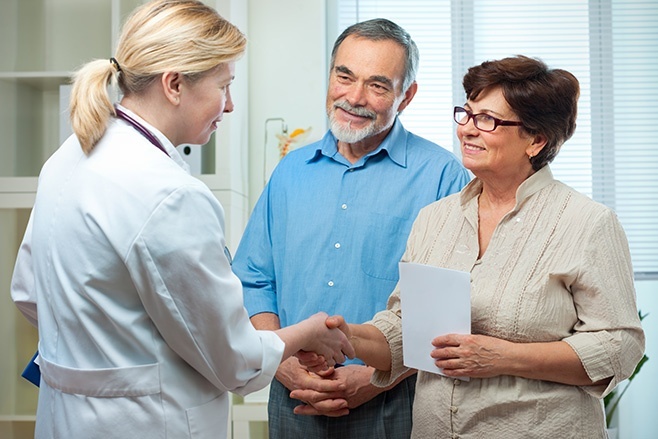 Referring physicians - What do they need to know in order to increase patient referrals? How do you handle other referring physician marketing activities so you can tie it into the website? Potential patients - This is the group you're probably most interested in growing to increase the practice's patient base over time. Since people do so much research on their own before going to a doctor, you want to be sure that you can be found, that your site gives the important information and that there is an easy-to-identify call to action (ie: request an appointment). 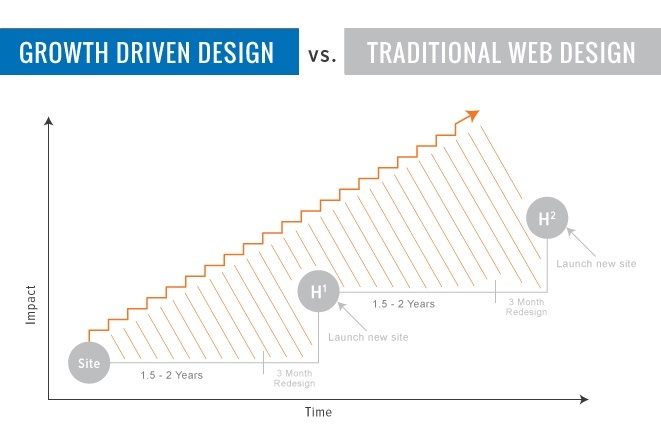 When you get started with the Growth-Driven Design website process, you only need to get the most important items addressed for each group on the first version that you launch. You may have a lot of information on your website right now and you're thinking, "How can I just get rid of that and start over?" Take a moment and think about what people are really doing on your site right now. Or better yet, pull your visitor data to see how many people have gone to the various sections of the site. What pages are they most interested in? And do those pages help accomplish the goals you have for your target audiences? But the key is to make it very clear and obvious for your target audiences what you have to offer them and what they can do while on the site. If you're going to get rid of the non-essentials for now, the essential things needs to produce results. Next you'll start to go through your prioritized wish list created during the strategy process. Here's the key: Test what you do to see if it's producing results. No point in keeping content or calls-to-action on your website if no one looks at them. If you're not getting the results you were hoping for on something that's important to the practice, then look for new ways to present the information and test it again. If you're still not getting the response you were hoping for you might need to take a step back to see if it's something that your target audience really wants. You will then start to see that the pages you have include content that your visitors find valuable. And if they find you valuable, they're more likely to schedule an appointment. Sometimes it's hard to create a medical practice website with a team of several different people, each with a set of things they feel is most important. Sometimes they overlap, and sometimes they don't. When they start to ask why all of their content items aren't on the site when it launches (or even a few months later), ask them to think about the priority list and what you will need to displace in order to get their priority added in sooner. Remind your team that your website is all about growing the practice and serving the current patients. Stick to these activities and you will be on the right path to building a website that does more than just verify that your medical practice exists. A Growth-Driven Design website works for you! If you'd like to learn more about the Growth-Drive Design process, download our free ebook or contact us to see how it can work for you.